This year marks the City of Victoria’s 150th birthday celebration, and to commemorate the occasion, a number of events and activities are planned around the Capital region over the coming months. As part of the birthday celebrations and the Victoria International Cycling Festival, Theatre SKAM be taking their acclaimed live performances to the trails. 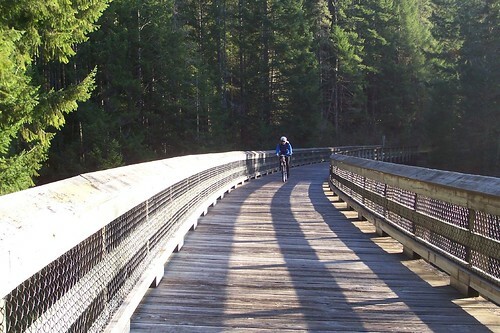 Winding along parts of the Trans Canada Trail, and built on abandoned train tracks and trestles, Victoria’s Galloping Goose Trail extends to 55 kilometres. This cycle path is a much-loved local favourite with an extensive history. Theatre SKAM will be presenting performances to celebrate the trail’s history with unique stories on the trail on June 16, 17, 23 and 24 at 3:30 p.m. The event will also feature bike decorating, local food and a few surprises for riders of all ages. For more information on the event, visit Theatre SKAM online or the CRD’s Galloping Goose Trail information page.